Mabie Todd (1843 – 1957) was the sucesor of Bard Bross that had started in 1843 in New York city making gold pen points and pen point holders. In 1873 was reformed to Mabie Todd & Bard Co and by 1880 were producing stylographic pens. In 1884 opened an office in England. In 1919 the company was sold to a Group in Great Britain. Most of the pens produced before 1920 were manufactured in New York city gradually diminishing up to 1938 when the American manufacturing division was closed down. 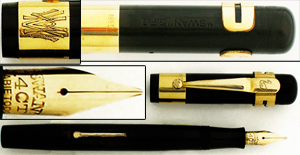 In Great Britain the manufactured Swan pens became the “pens of the British Empire”. The British company finally ceased production in 1957. The Eternal line was the contribution of Mabie Todd to the lifetime warranted pens. A slightly less expensive pens than the Swan were the Swallow and the Blackbird. The pens manufactured by Mabie Todd were of incredible high quality, their works in gold and silver comparable to the metal work of Tiffany.